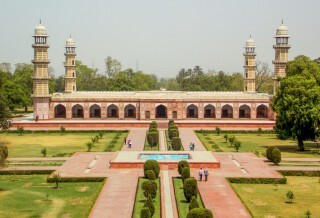 The Tomb of Jahangir is a mausoleum built for Jahangir, who ruled the Mughal Empire from 1605 to 1627. 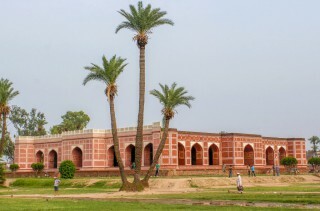 The mausoleum is located in Shahdara Bagh in Lahore, Punjab, Pakistan. The tomb is located at Shahdara, Lahore. The region was a "favourite spot" of Jahangir and his wife Nur Jahan, when they lived in this city. When Jahangir died in 1627 in Rajaur, near Lahore, he was initially buried in Dilkusha Garden. But his son Shah Jahan, ordered that a "mausoleum befitting an Emperor" should be built in his honour. Though contemporary historians called Shah Jahan the builder of this tomb, it is "more likely to have been the result of Nur Jahan's vision". Taking inspiration from her father's burial place, she is said to have designed the mausoleum in 1627. She influenced the architecture and the gardens of the monument as she became a resident of Lahore after Jahangir's death. It took ten years to build the tomb and costed Rs 10 lakh.The construction started in 1627 and ended in 1637. It was "probably funded" by the imperial treasury or, Noor Jahan might have herself funded it. 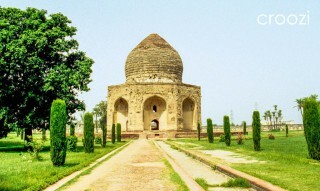 The tomb, along with the adjacent Akbari Sarai and the Tomb of Asif Khan, is on the tentative list as a UNESCO World Heritage Site.